It doesn't matter how much beautiful the hands you have or how much time you spend on manicure because if you have dark knuckles or finger joints, they can decrease the overall beauty of your hands or can ruin the beauty of your manicured hands in no time. Much like our ankles, elbows and knees, our knuckles also have a tendency to acquire a darker complexion than the skin around them. Continuous negligence, improper cleansing, accumulation of dead skin cells, excessive dryness, lack of moisture, sun tanning, over production of skin melanin and low level of haemoglobin are some common causes that may lead to gradual darkening of your finger joints. However, here we have some best natural home remedies to get rid of dark knuckles or finger joints. Lactic acid in buttermilk helps to lighten and brighten your skin while skin bleaching properties of lemon juice are very beneficial in getting rid of dark knuckles or finger joints. Take two tablespoons of buttermilk and add 1/2 teaspoon of lemon juice and then apply on dark finger joints. Massage in circular motions for 3-5 minutes. After 15 minutes wash off using lukewarm water. Soak a bread slice in some milk and leave it for 1 min and then just apply it on your dark finger joints and massage for 3-5 minutes. Let it stay for 5-10 minutes then wash it using fresh water. This simple home remedy is highly beneficial for skin exfoliation. Bread slices soaked in milk act as natural scrubber and remove dark dead skin cells while milk deeply moisturize your skin and naturally lighten your skin tone. To remove darkness around your finger joints take about 1 tablespoon of milk cream and massage your finger joints for 5-10 minutes. Now take a fresh lemon slice and rub this on the affected areas for 5 minutes. After 10 minutes wash off with fresh water. Lemon juice along with sugar acts as an excellent natural in getting rid of dark joints. Mix 1 tablespoon of lemon juice with one teaspoon of sugar and gently rub on the dark joints. Finally wash off and apply a good moisturizer to prevent skin dryness. Repeat this on a daily basis to lighten dark finger joints. An other good scrub to lighten your dark joints is a mixture of lemon juice and salt. Take one tablespoon of lemon juice and mix with one teaspoon of salt. Apply on your dark joints and massage for 3-5 minutes. Leave for 10 minutes and rinse off with fresh water. Finally pat dry your skin and apply a good moisturizer. Take 1 tablespoon of oatmeal power and mix with 1 teaspoon of sour yogurt and 1/2 of cucumber juice. Mix them well and apply on your dark but clean finger joins. Massage for 3-5 minutes and leave for 20-30 minutes. Finally wash off with fresh water. For best results repeat this procedure on a daily basis. Take 1 tablespoon of gram flour, 2 tablespoons of raw milk and add half teaspoon of lemon juice. Mix all the ingredients to make a thick paste and apply on your dark finger joints. Massage in circular motions for 3-5 minutes. Now let it stay for 15 minutes and then rinse off using cold water. Regular application will give you an amazing result within few days. Skin bleaching properties of lemon juice and skin moisturizing properties of honey are highly beneficial in getting rid of dark finger joints. 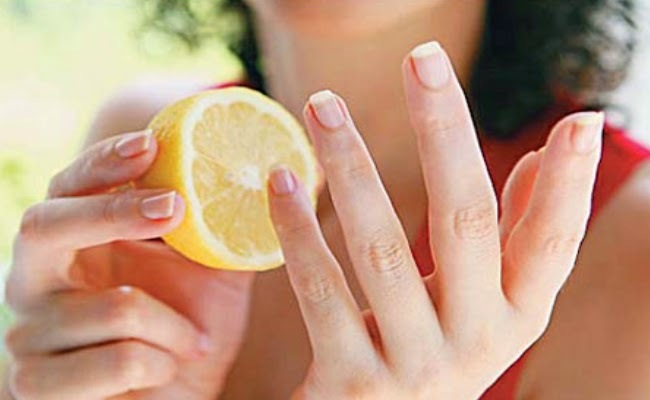 Take equal amounts of lemon juice and honey and rub this mixture on your dark finger joints for 5-10 minutes. Leave for 15 minutes and then rinse off. Skin softening and glowing properties of milk cream along with skin bleaching properties of turmeric are highly beneficial to get rid of dark knuckles. Take about 1 teaspoon of milk cream and mix with 1/2 teaspoon of turmeric powder and 1/4 teaspoon of almond oil. Now apply this paste on your dark knuckles and massage in circular motions for 3-5 minutes. Leave for about 15 minutes and finally wash off with fresh water. A mixture of yogurt and almond is also very beneficial in getting rid of dark knuckles. Lactic acid in yogurt smoothen rough skin, exfoliate dead skin cells and moisturize dry skin while skin whitening properties of almonds are also very helpful in removing darkness from your knuckles. (i) Take 1 tablespoon of yogurt and 1/2 teaspoon of grounded almond powder. Mix them well and apply this mixture to your dark but clean knuckles. Leave at least for 15 minutes and then then wash off. (ii) An other great way to get rid of dark knuckles is to make a yogurt and almond scrub. To prepare this scrub take about 1 tablespoon of yogurt and mix with 1/2 teaspoon of coarsely ground almond. Rub this mixture on your dark knuckles for 3-5 minutes. Leave for about 15-20 minutes and then rinse off.